“It’s a sight and sound so commonplace, Advent almost wouldn’t seem the same without it. 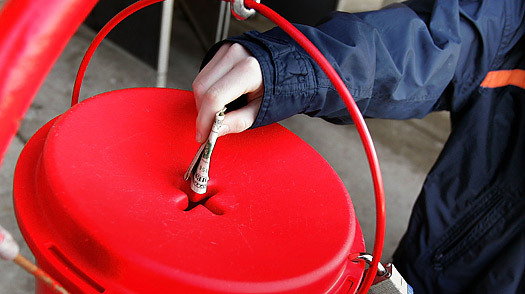 “In so many of the stores we visit to do our Christmas shopping, we see the ever-present volunteers ringing bells soliciting donations for one of America’s best known charitable organizations: The Salvation Army. “Many of us give what we can, moved by the spirit of the season to increase our charitable works. STEVE RAY HERE: thanks I just posted the link as an update. The link doesn’t seem to link. STEVE RAY HERE: I checked the links and they worked for me. the Knights of Columbus were teaming up with the SA at one store. I am so sorry I didn’t speak to them about this stark difference. I know they want to help the poor and people overlook the abortion part. Next post: I Like the Bishops Recently Chosen; but Now a New Group of “Bishop Pickers” has been Chosen. Hum?